This card’s name becomes “Cyber Dragon” while on the field or in the GY. You can only use 1 of the following effects of “Cyber Dragon Herz” per turn, and only once that turn. ● If this card is Special Summoned: You can make this card’s Level become 5 until the end of turn, also, you cannot Special Summon monsters for the rest of the turn, except Machine monsters. ● If this card is sent to the GY: You can add 1 other “Cyber Dragon” from your Deck or GY to your hand. Cyber Dragon Herz is another Cyber Dragon in disguise that is meant to help the deck. “Cyber Dragon” while on the field and in the grave, this Level 1 has two effects that can be used once per turn, and only one of them you get to you. Xyz-based effect for the first effect, changing the level to 5 if you Special Summoned Herz (easy to do in the archetype and as a Level 1). It locks you into Machine-Type Special Summoning, but that isn’t a problem for Cyber Dragon-based decks. Regular search ability if sent to the graveyard for another “Cyber Dragon”, but it also can pull a “Cyber Dragon” from the grave to the hand. The search ability is nice, not dependent on destruction, and can get something useful back from the grave if you had the resource available there. Cyber Infinity is possible with a Special Summon of Cyber Dragon, then a One For One with this card. Having another searcher in the deck alongside Cyber Emergency will help you get to your Cyber Dragon or “Cyber Dragon” monsters quicker than conventional drawing/searching. Cyber Dragon Herz is a Level 1 Light Machine-type monster with 100 Atk and 100 Def. It is honestly nice to not be reviewing Synchro Monsters, though I wouldn’t mind if Herz were a Tuner. I digress because the stats don’t really matter. Herz becomes Cyber Dragon while on the field or in the grave. That’s mandatory and excellent. The more Cyber Dragons the better. Then if Herz is Special Summoned you get to make it Level 5 on the field and can only Special Summon Machines for the rest of the turn. Finally, if Herz is sent to the grave from anywhere, you get to search a different Cyber Dragon from your deck or grave to your hand. You can only use one of the optional effects per turn, and only once per turn. If you don’t need it to be Level 5, use One for One and then send it to the grave for the search effect. If you’re going for Infinity, keep Herz as Material until the next turn. Very easy and very free effects. Cyber Dragons have always been cool and have always looked amazing. As such, I like Herz. Run three in a Cyber Dragon deck or one if you’re running One for One as an additional target if Glow Up Bulb is spent. Now I will dive into the Cybernetic Horizon support for Cyber Dragons, starting off with Cyber Dragon Herz. Herz is a Level 1 LIGHT Machine with 100 ATK and DEF. LIGHT and Machine are good types to have. Stats are expected on a Level 1, which makes for One for One support, but it makes Herz the second Machine Duplication target in the deck, Nachster will be the third when it comes out, which is good because Herz is treated as Cyber Dragon while on the field or in the GY, so Machine Duplication will get you 2 Cyber Dragons. Herz has two effects and you can only use one per turn. If Herz is Special Summoned, you can make its Level become 5 but you cannot Special Summon monsters except for Machine monsters. If this card is sent to the GY, you can add 1 Cyber Dragon from your deck or GY to your hand. The first effect can come in handy for summoning a Cyber Dragon Nova if need be, but the second effect is much better. It does not matter how you send Herz to the GY as long as it goes there, you’ll get a Cyber Dragon. If you search from the deck, you have to get the original Cyber Dragon, but there are many monsters that are treated as Cyber Dragon in the GY that Herz can grab back. Herz is a great Machine Duplication target that really helps you keep advantage. All of the three Machine Duplication targets I mentioned are three ofs in the Cyber Dragon deck, sadly Nachster isn’t TCG legal yet. Art: 4/5 I assume the heart of Cyber Dragon is… a smaller Cyber Dragon? 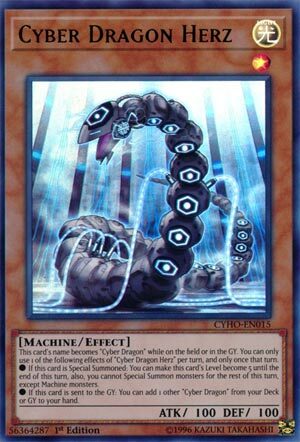 Cyber Dragon Herz, another card that becomes Cyber Dragon on the Field and in the Graveyard. This little Machine is Level 1, Light, with 100 attack and defense, and a couple separate effects. Both effects of choice are once per turn, and only one can be used per turn. *Or if sent to the Graveyard (regardless of from where, how, or by whom) you can add another Cyber Dragon from your Deck or Graveyard to your Hand. Take your choice of what you choose to Special Summon in the Cyber family if you’re using the first effect. The second effect is much more useful and versatile of the two. I imagine that’s like the one the player would be choosing. It’s almost laughable how easy it is to get that effect to go off, and this is a great little asset to the Cyber Dragon player. Next articlePokemon Go – Get an Eevee That Knows Last Resort on August Community Day!